Sydney: Palm Beach on one side, the harbor on the other. All photos by Juliana Jaoudi. How do you show a visiting American who wants to travel to Australia everything your vast continent has to offer? Sydney native Jay Riedl devised a two-week tour. SYDNEY – How do I show you a good time down under? It's a valid question. I'm Skyping with my friend , who's arriving in two days. I'm on my annual Christmas pilgrimage visiting family in Sydney, and Julie has decided she needs to get the hell out of dodge. Dodge is New York, and apparently Australia is the ultimate get-out. It's Christmas Eve, and we have no idea where we're going or what we want to do. I haven't lived in Australia for years, so I'm not much help. The only thing I know is that the entire country is about to grind to a halt and go on holiday. "It's a really big country," I tell her. We discuss the options: a little Sydney, a little beach, the outback, some coastal, the rainforest, wine country, scuba diving on the Great Barrier Reef, and meeting friends at the Australian Open in Melbourne. Essentially, she wants to see everything. In twelve days. "Sure," I say. "That sounds doable." Pre-show drinks at the Opera Bar. Julie arrives and we spend three days in Sydney while she acclimates. We hit the usual spots. The beaches: Bondi, Whale, and Palm. 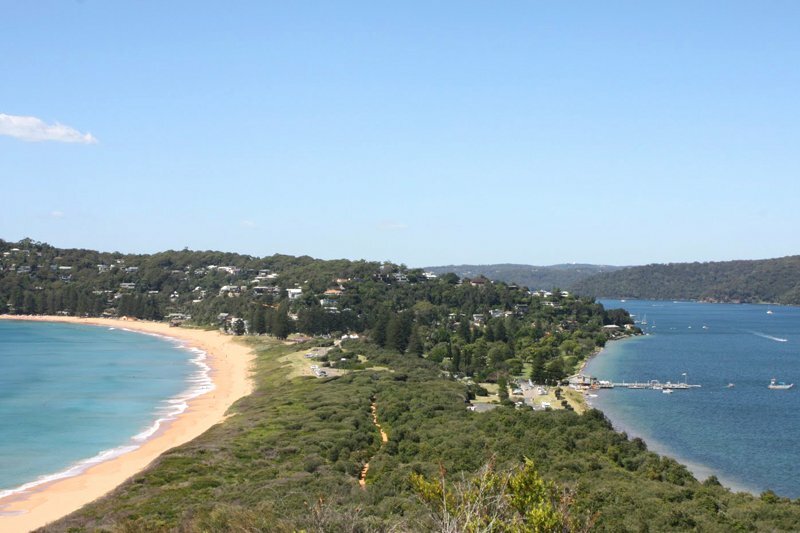 We climb up to the lighthouse at Palm Beach; we swim in the rock pool at Whale Beach. We do the breathtaking and back again. A view to die for along the walk from Bondi to Bronte Beach. 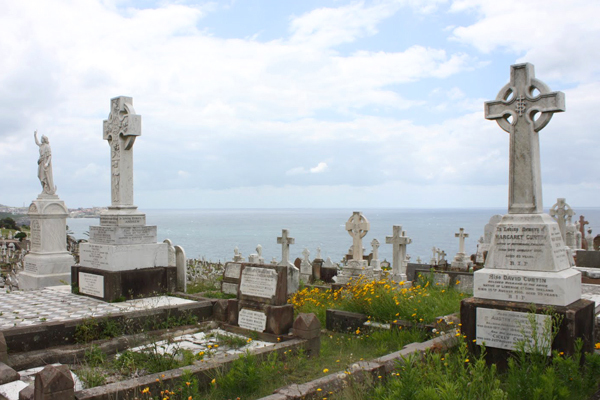 We zip through my preferred tourist spots: , (where Sydney began), and . 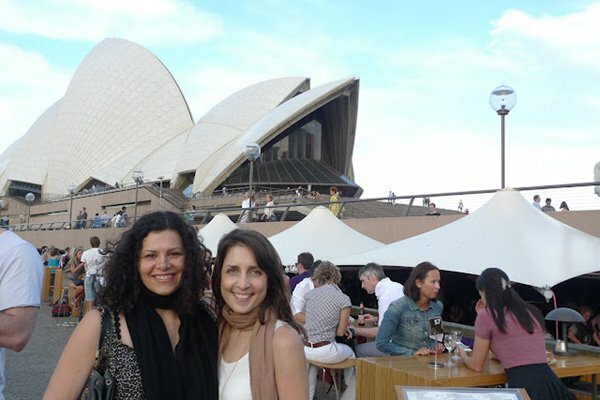 To imbibe, we go to the at the Opera House, which is pretty perfect at Pimms o'clock. We shop for flowy summer dresses and chunky jewelry in Paddington (Oxford and William Streets and Glenmore Road), Potts Point, and Surry Hills (Crown Street). 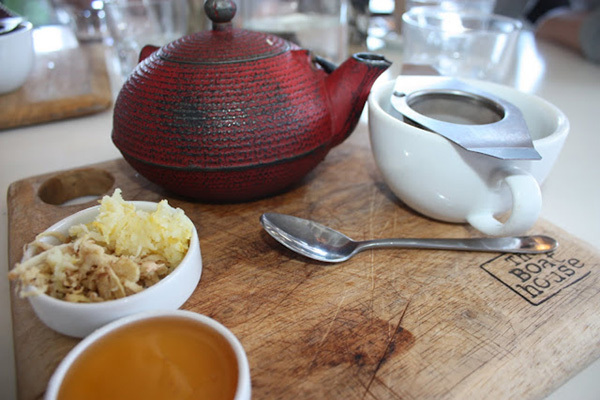 My favorites are , , , , , , and in Paddington and and in Potts Point. Ginger tea served the right way at The Boat House. All this activity makes us hungry, so we stop at my favorite restaurants. For breakfast, that means at Palm Beach (the Hamptons of Sydney) and The Crabbe Hole on the pool deck at the (best view, best coffee).For lunch, it's (modern Australian cuisine on the beach), (inner city Italian, deliciousness), (a little Paris in Potts Point), and various sushi shops. For dinner, (incredible Asian fusion food served by haughty waiters), (Asian fusion alfresco on a finger wharf), and (my mum says it's the best). 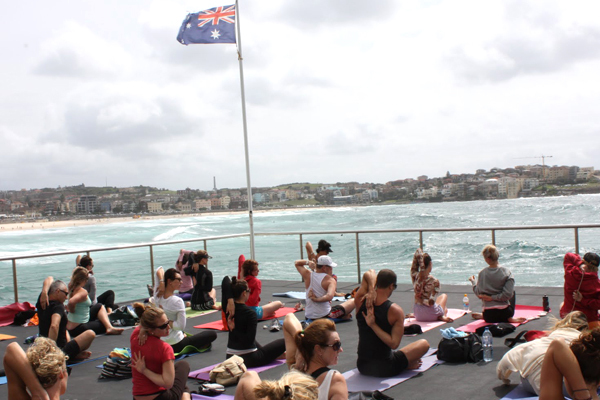 Yoga on the deck at Bondi Icebergs. Three days are up, and it's time to hit the road. We still don't have much of a plan, but we discover two key things. 1. It's the wet season, which means the Northern Territory is under water. 2. It's also stinger season, a charming time of year when everything that can sting you is in the water surrounding the Great Barrier Reef. We eliminate northern Australia, and Julie Googles . We've been debating whether to go to one of the or on the mainland. My argument is this: There are stingers on the Great Barrier Reef this time of year, and those islands are mostly for lovers or families. We are neither of these things. We could do a spa vacation, but after traveling all this way, that seems lame. We want more action. Byron, a hippie surf town, offers a wealth of activities with just as much beauty and friendly water. The locals in Byron complain that the town has lost its original charm. Though it has become a tourist spot, it's still a quaint beach town, which has allowed local communities nearby to flourish, producing great restaurants and eco resorts. We stay at the delightful , a low-key resort with its own rain forest; a delicious, locavore restaurant; friendly service (thank you, Troy); built-in kitchens; great massages; and enough luxury to make you feel like you're on holiday. Scuba at one of Australia's top five dive spots, . The crew at took us out and brought us back in one piece. It's not "The Reef" but it's pretty damn close, and we did see sharks. The waters at the Tea Tree Lake. Swim in the medicinal Tea Tree Lakes at Lennox Head. 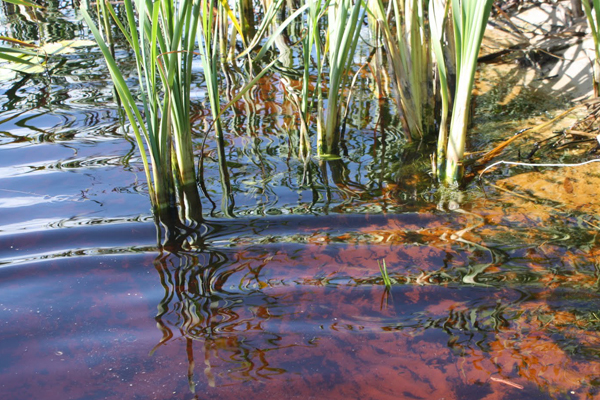 The freshwater lagoon is surrounded by tea trees which leech tannins into the water, giving it a soft scent, amber color, velvety texture, and healing properties. Best not to drink it though. Drive around the lush hinterland of Byron. It's one of the most beautiful areas in Australia. At midnight, get a bottle of Champagne, a torch, and wander through the rain forest, which comes alive at night. It will be you and the frogs that hop across your path. Make your way down to Tallow Beach. Sit. Listen to the waves. Drink. 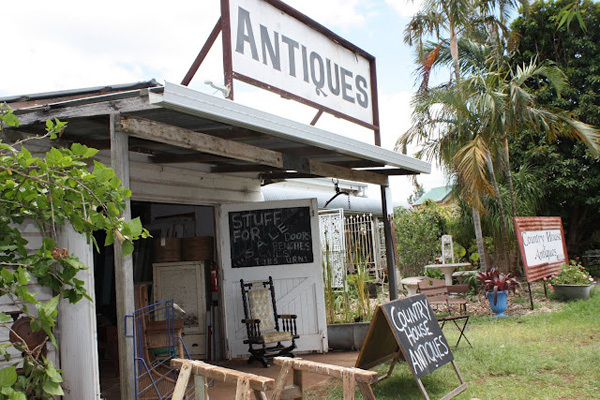 An antiques store near Byron Bay. Harvest Cafe at Newrybar: Nestled in a quaint one-horse town and flanked by antique stores, Harvest was voted the best contemporary regional restaurant of 2011 by Savour Australia and best wine list by Gourmet Travellers. They've turned a rustic 100-year-old cottage into the hottest restaurant around. Go for brunch — or really any meal — and be sure to make a reservation. (The Fish Café): It's old school, it's deco pink, it's on the beach, and it was voted one of the world's top 25 Hotels by Condé Nast Traveler. Stay if you can afford it, but if not, just go for dinner and order Moreton Bay bugs with lemongrass. They're lobsters, and they're delicious. : It's light, fresh fish done however you want it. for unique, sophisticated women's swimwear and for gifts to bring home. The American and the Aussie. While in Byron, we have to work out where to go next. The Northern Territory is under water, Tasmania is too cold, Victoria doesn't seem exotic, and Western Australia is just too damn far. That leaves us Queensland and South Australia. I've seen a lot of Queensland, and we want to go somewhere new to us both, so South Australia wins. I've never had any desire to visit because I couldn't find one good reason to go, but my American friend wants outback and wine country, so we jump a flight to Adelaide. 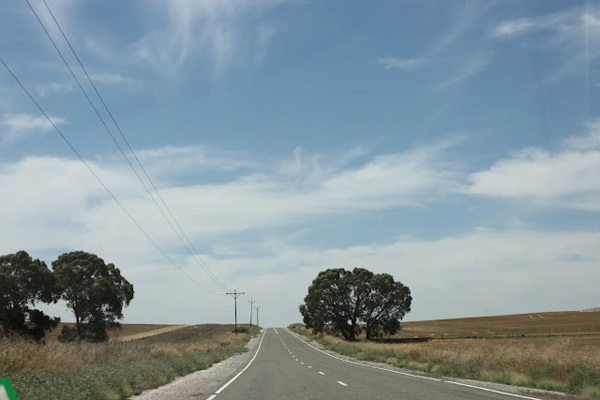 The next day, we zoom out of Adelaide, and after a few hours driving we're hungry and in the . We stop at , an enchanting little restaurant in the vineyards. The food is simply great, made from local produce and served with their wine on a verandah overlooking the vines. We don't stay long, as we have a lot of distance to cover. On the road from Adelaide to the Flinders Ranges. The outback, it turns out, is waaay out back. We've been driving for hours, it's about 100 degrees, and there's an enormous bushfire looming in the distance. I'm not sure if we're going to make it. 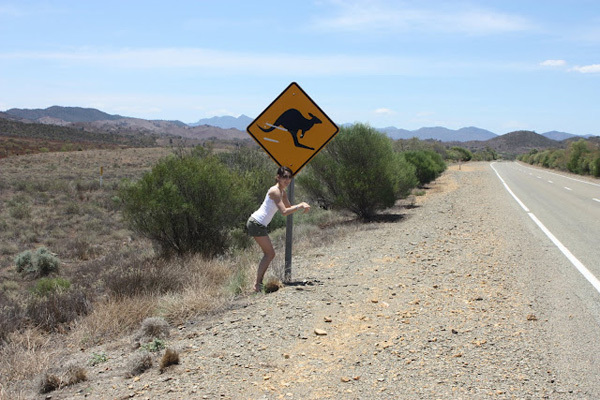 Julie delights in the kangaroo signs that we keep passing. Eventually, we switch seats and Julie begins her driving shift. She's a California girl and used to the 405. She keeps driving on the wrong side of the road, and I don't trust her. Twilight is upon us, the fire is still burning, we are alone on the road doing 80 miles per hour, and Julie sits with one leg tucked under her and one hand on the bottom of the wheel. "Do you think you could put both hands on the wheel?" I ask. "That's kinda annoying," she replies. "Well, you know we're driving pretty fast and wildlife...." I trail off. "Really," she snips and puts both hands on the wheel. We drive in silence for a while until we reach our turn-off, a gravel road. 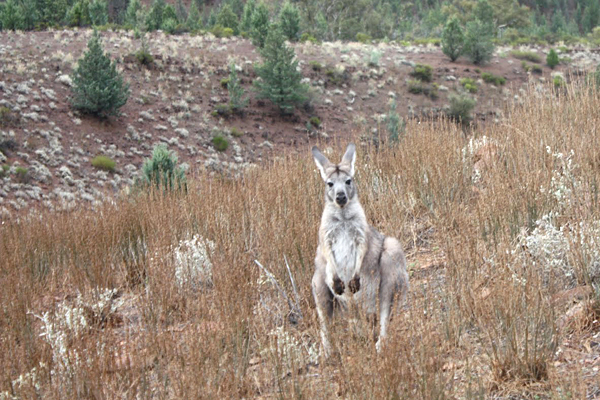 Suddenly, a big red 'roo jumps in front of the car. Julie screeches and swerves. "What was that?" she squeals. It turns out that those warning signs are there for a reason. A view of Arkaba Station from the hills. Our destination is in . We are the only guests, as no one else has braved the extreme temperatures and massive bush fires. (Sometimes it pays to be the stupidest people around.) 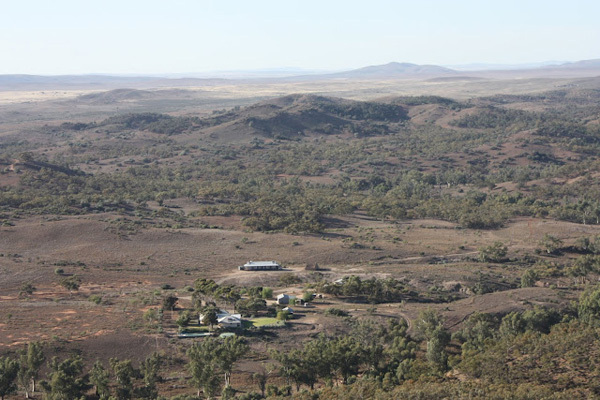 The only way to really experience the Flinders in an up-close, intimate, tourist-free way is by staying at at Arkaba, a classic 60,000-acre sheep station dating back to the 1850s. A typical day here involves activities like guided walks and hikes, visits to the sheep station, and four-wheel drive excursions. The lodge also offers scenic flights, hot air balloon rides, or extended four-day walkabouts. Over time, the sheep numbers have been reduced to a minimum, but Arkaba's efforts to conserve wildlife have been successful: kangaroos and emus have the run of the place. We stay at the original homestead and have the undivided attention of two tour guides and a chef. They have devoted their lives to this environment: They know everything about it, and their hospitality is unparalleled. The lodge is part of the , and it lives up to its name. The Flinders can be seen from every room, and they change color by the minute. I had no idea Australia could be this beautiful. It looks like a painting. 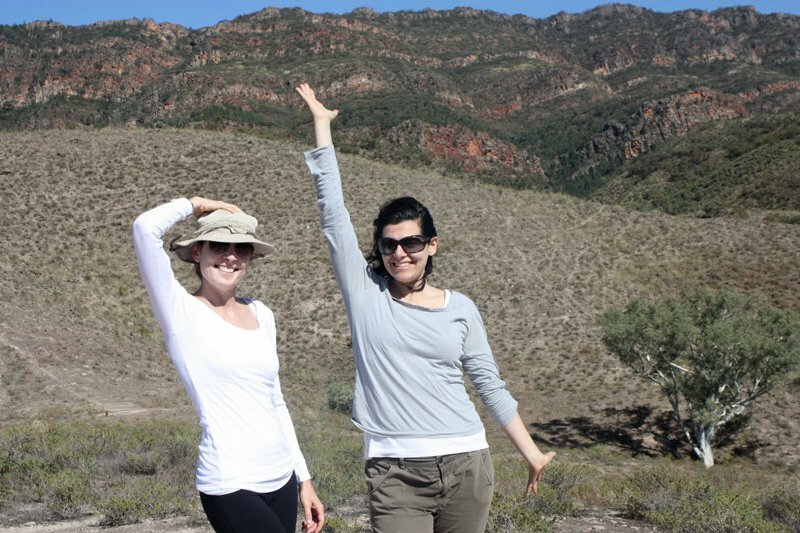 Over the next two days, we hike, we four-wheel drive, we see 'roos of every kind and a few emus. It's pretty magic. On outback through the Flinders at sunset. 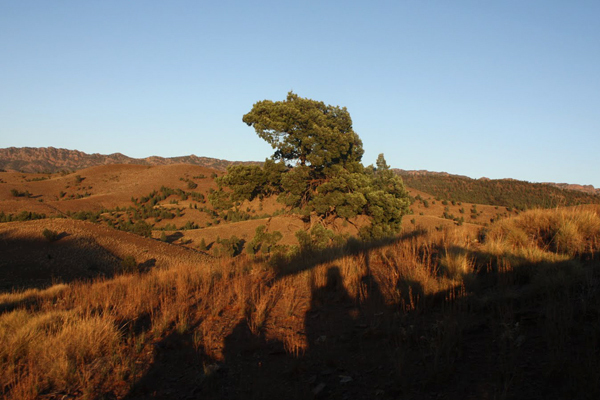 On the second day, we visit Wilpena Pound, a mountain amphitheater in the Flinders Ranges National Park, where a series of walks can take from 40 minutes to six hours. If you are heading this way, you might want to bring food: The options are very limited, one restaurant and a general store. The following day, is our biggest driving day. We have to cover 600 miles. Road kill lines the highway, and Julie drives with both hands on the wheel. We are trying to make it to the start of the , but we just don't make it. We end up at the , which is funny as it's located in , a wine region famous for its reds. Coonawarra is a delight. We have breakfast at . There was a wedding the night before, and happy hung-over party guests fill the streets and play frisbee in the park. I wish we had time to visit some cellar doors and go to . A few of the Twelve Apostles on the Great Ocean Road. We're back on the road and pull over to have lunch at Port Fairy. Originally a whaling station, it's now a charming fishing town which has done a great job of preserving the heritage buildings on Main Street. It's like stepping back in time but with quirky little shops like and great restaurant choices (for insane cakes, try ). The Great Ocean Road is a 151-mile stretch that twists from Warrnambool to Torquay on the scenic route to Melbourne. We see all the major spots: The Twelve Apostles, London Bridge, Loch Ard Gorge, and Gibson Steps. That it's a big tourist area is its downfall. The coastline however is spectacular and worth the effort. The drive is fun and not too challenging. We spend the night in Apollo Bay, a not-much-to-it beach town. We stop there because it was getting dark and we wanted to see the coastline as we drove. The next day, we have coffee in Lorne, another beach town with a lot more going on and a better vibe. We continue towards Melbourne, detouring to Bells Beach from Point Break. The surf is kinda flat, and the local boys are sitting around complaining. A little mascot for the ride home. We could have made many other stops on our way to Melbourne — Ballarat, an old gold rush town, other inland detours — but we are out of time and ready to get back. We arrive in Melbourne, have lunch on Chapel Street, and peek in a few shops. The Australian Open won't begin for a few days, so we are unable to check this off our list. We're okay with that. It's time to go home, and so we climb in our sweet, cheap, dirty Ford rental for the last time. We drive to the airport without getting lost. 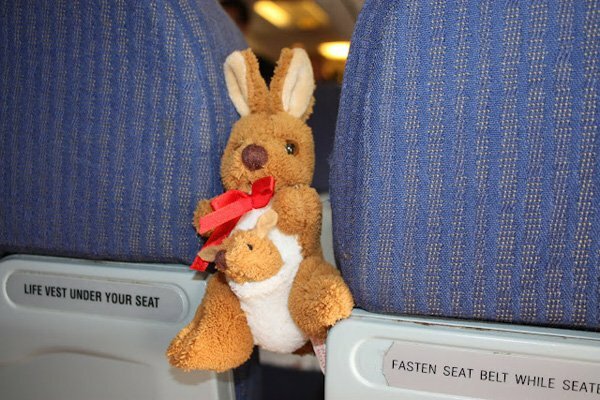 I buy Julie a stuffed toy kangaroo while we wait for our flight.